A specially-made ale created in Aviemore is helping to raise money for the conservation of the endangered species. Beer drinkers have helping to save one of Britain's rarest mammals from extinction by drinking gallons of real ale. A special campaign has been raising money to save the wildcat which is in serious danger of being wiped out. Cross-breeding with domestic cats has helped to put the feline, sometimes known as the Highland Tiger, onto the endangered species list. 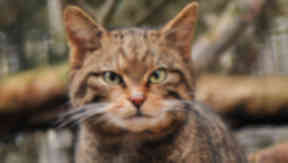 The campaign, called the Highland Tiger project, has received funding from the Cairngorm Brewery in Aviemore which produces a speciality Wildcat Ale. For every bottle sold the micro-brewery makes a donation from the sale of the malty brew to the conservation project. Over the last two years almost 100,000 bottles of beer has been sold, raising enough money to sustain vital monitoring equipment at the Cairngorm National Park. So far, almost 100,000 bottles of the beer have been sold in the past two years. Douglas Richardson, of the Royal Zoological Society of Scotland, said: "The support we are getting from the Cairngorm Brewery is helping us to get our message across of the plight of the Scottish wildcat out to en even wider audience. "The latest donation will help provide batteries for our camera traps. "Rechargeable ones don't last long enough before they need to be replaced, especially when the temperature drops in the winter months. "Without the batteries, we have no working cameras, and without cameras, we have no pictorial documentation of cats in the wild in the Cairngorm National Park." The Highland Wildlife Park in Kincraig has six wildcats and celebrated the birth of two kittens in March. The number of the shy and elusive species in the wild is believed to be only around 400 and one of its last strongholds is the Cairngorms and the Spey Valley.